Please take a look around and get an idea of what our friendly club gets up to. 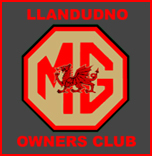 We welcome new members and our annual Snowdon MG Run is open to MG drivers from all over the world. If you’re interested in joining, further details are here. 2019 Event Calendar now available.